Fallout 4 came out today and I have been watching people streaming their games all day because I can’t afford to buy it for myself yet *sad face*. Anyway, on with the review…what is it with having nuts at Christmas time? Heck, it isn’t even Christmas yet but you can buy absolutely everything you need for the season right now. 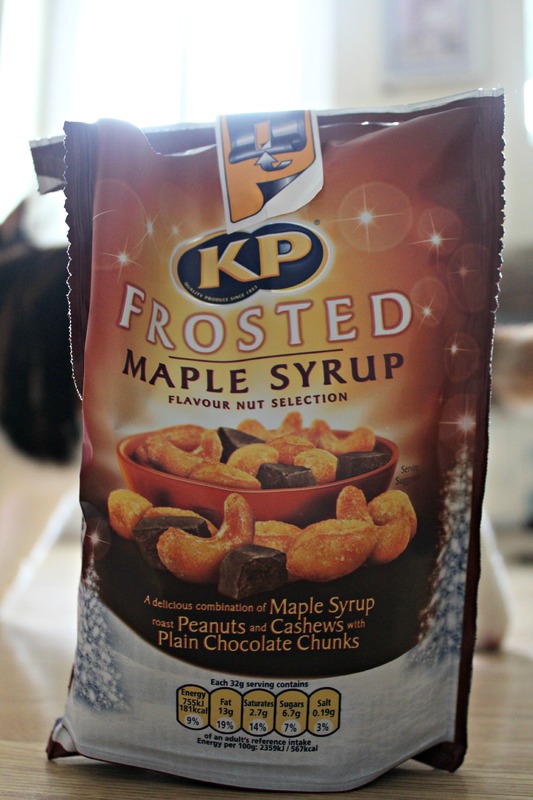 I had a little browse in Tesco for Christmas snacks and found these maple frosted peanuts and cashews with plain chocolate chunks, the ingredients seemed okay so I picked up a pack. They were really nice, the flavour was sweet and also a little salty, and the plain chocolate chunks made the mixture creamy and rich. I found the nuts quite filling, so it took me a while to eat them, I’m not sure if I would buy them again because the coating gets quite damp in my house. As time goes on the nuts got less and less edible, but that’s not a fault with the product. I picked up this 225g pack in Tesco for £2. Ingredients: Peanuts (53%), cashew nuts (17%), plain chocolate chunks (15%) [sugar, cocoa mass, cocoa butter, dextrose, emulsifier: soya lecithin, natural vanilla flavouring], sugar, maple flavour [sugar, salt, natural flavourings, maltodextrin, acid: citric acid], sunflower oil, maple syrup (1%), glucose syrup, and stabiliser: xanthan gum.